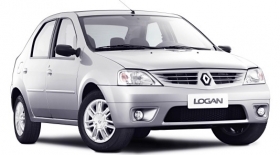 Renault is counting on the Logan to boost sales in Brazil. SAO PAULO (Reuters) -- Renault expects the Brazilian vehicle market, Latin America's largest, to grow about a third to 4 million units by 2014 as household income and Latin America's largest economy recover from a downturn, its managing director for Brazil and Mercosur said. The company is seeking to double its market share in Brazil to 10 percent by revamping existing models and betting on cars with prices up to 30,000 reais ($15,000), Jean-Michel Jalinier said in an interview. Renault is trimming operating costs partly to mitigate the impact of the global financial crisis. In the meantime, it is working to boost its presence in Brazil without deploying heavy sums of money or designing new models, Jalinier said. In the past three years, Renault has invested 1 billion reais in Brazil. "We are very weak in the segment between 20,000 reais and 30,000 reais and we have to be in that segment," Jalinier said. "I don't see why we should have more models so we need to redesign the position of our products in the market," he added. Renault has the Logan and Clio compact models competing in that segment. Last Wednesday, Renault CEO Carlos Ghosn said during a visit in Brazil that the company must adapt to Brazil's culture of small, low-cost, fuel-efficient vehicles. The company operates in Brazil at half its capacity of 250,000 cars per year. In 2009, Renault expects to produce 127,000 units, 3.8 percent more than 2008. "Today it is impossible to improve our EBITDA margins since the market is very competitive," said Jalinier, without elaborating. Renault announced on Friday its global sales of passengers cars dropped 13.7 percent in the first half to 969,360 units. Of this amount, Brazil, the fifth-largest market for the group, accounted for 56,000 units, compared with 61,000 a year before.